Editor’s Note: On March 25, 2012 we published our new bookstore database. At the same time we also published a list of over 100 bookstores that have closed in just the past few years. Most Black bookstores failed to take advantage of this trend. According to WebPro News, books are the #1 item people purchase online. Other brick-and-mortar chains, such as Blockbuster, also were flanked by their online competition, so this trend is not exclusive to bookstores. The advent of Internet sales ushered deep discounting on books. Because large online sites like, Amazon and Wal-Mart, are able to take advantage of volume discounts, Black bookstores could not match these discounted prices and, if they tried to, they were unable to maintain profitability. 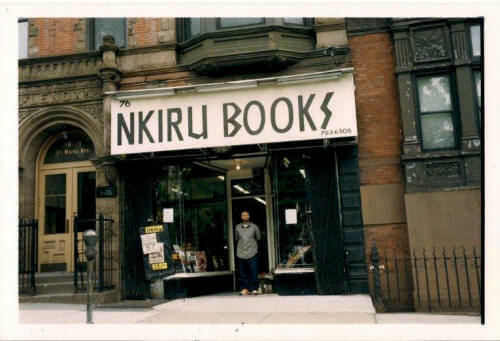 With the advent of price competition and Internet book sales, diversification into other product lines was the only way Black bookstores stood a chance of maintaining viability. Most did not make this adjustment fast enough and some didn't make it at all. African American consumers do not have a tradition of loyalty to Black-owned establishments. If they can purchase the same products at a white-owned (Asian-owned, or any non-black owned) establishment, they will do so FIRST. The vast majority will only shop at a black-owned establishment if they have no choice -- if they are unable to obtain a much-desired item elsewhere. This is the primary reason why dollars leave our community so rapidly, while other ethnic groups have loyalty to their merchants and turn dollars multiple times. Owned by Doubleday, Black Expressions Book Club has the financial resources to advertise in every major Black magazine in America. They offer 4 books for $1 to African American consumers if they agree to purchase X number of books over a two-year period. They now have 460,000+ Black readers as members and these individuals obtain many of their books this way, rather than shop at brick-and-mortar bookstores. A lot of the members of the club actually believe it is Black-owned, when it most definitely is not. Many of the Black-owned bookstores are located in predominantly Black neighborhoods. The reading population of Black consumers tends to be middle-class and these people tend to live in suburban areas and mixed-raced communities. The bookstores are not in proximity to their most likely clientele. Many people who opened Black bookstores did so because they had a passion for literature, but not necessarily because they had good business and management skills. A business requires experienced management in order to be successful. It also requires sacrifice -- one has to reinvest dollars into their business for the long-term, especially during the early years, and not take money out of the business for personal "bling." When the economy goes into a recession, the firms in the weakest position are among the many casualties. Many of the black-owned bookstores were already barely hanging on when the economy took a nose-dive in 2008. With limited financing and a dwindling clientele, they simply had no choice but to close their doors. Business ownership is not for the faint of heart and requires a tremendous commitment. Recessions will come and go, but if the commitment is there, the entrepreneur will find a way to adjust with the environment. It may be painful during the tough times, but faith, ingenuity, a willingness to be innovative and stay abreast of the industry will lead to ultimate success. To survive, these stores must figure out how to remain relevant.